Welcome to the ELW Manufacturing, Inc. Website! Edged Cutting Dies, you have come to the right place. Our Envelope Dies cut out the seal flaps, side profiles, and windows of envelopes. These dies are either rotary, or seal and back flap knives, depending upon their application. Clicker Dies may be used to cut out patterns in fabric, rubber, and a number of plastics, for a wide variety of products. We produce forged, pre-finished, and steel ruled Clicker Dies. Pair one of our superior cutting pads with each of your custom clicker dies. We also manufacture fancy dies, including the following types: Flatbed; Folding; Marker; Embossing; and Debossing. Send us a pattern, and we will bend a thin piece of steel to match it perfectly, and then use this template to create a finished product for you that will perform accurately and reliably for years to come. ELW Manufacturing, Inc. takes a great deal of pride in the work that we do, and so do our workers, who average at least 25 years of experience a piece in this industry. 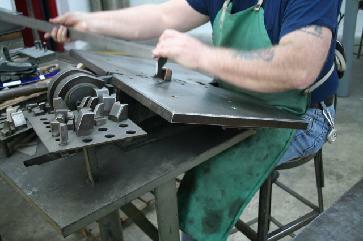 In addition to fabrication, we provide a host of other services. Among these are the following: Reconditioning/Resharpening our own products as well as those of others; CNC Machining; In-house Die Cutting; Heat Treating; Tefloning; Welding; and Grinding. For more information on our Envelope Dies and Clicker Dies, explore these areas of the website, or contact us today.